It was a long trip but it went by rather quickly. 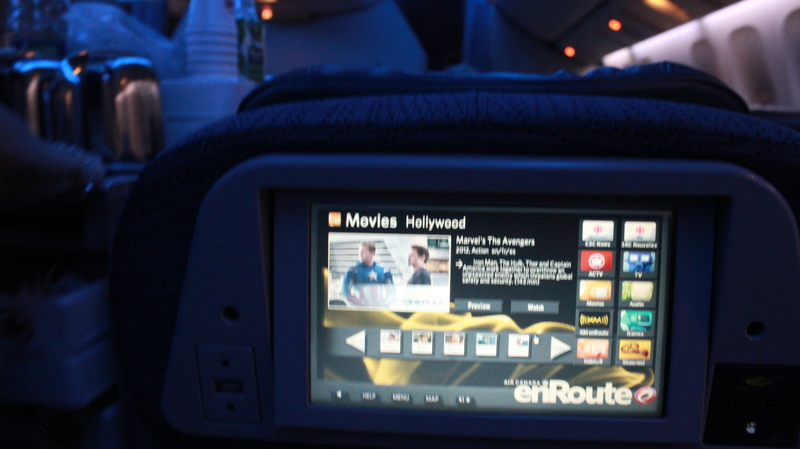 It was the first time in a long time that I used Air Canada. They had a huge selection of movies. They had very recent releases, including movies that are still in theaters in Japan. 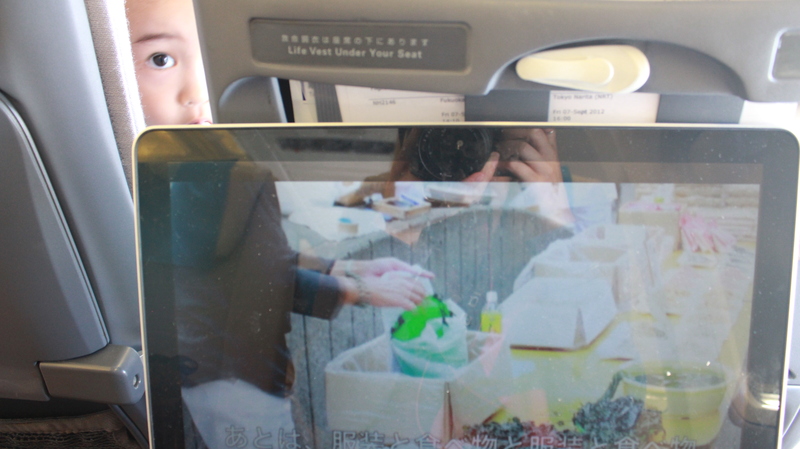 They had USB and regular power outlets at the seat, which made it easy to work. And they had a selection of Japanese and Western style meals, but I chose mostly Western food. They said that we would get soup and a sandwich during our trip but.. I never expected that by “soup”, they’d mean THIS. Not exactly the kind you eat WITH a sandwich. But I like cup noodle, so I was happy with that. It was dark inside the plane, the calm and relaxing illumination made it really easy to sleep. This time, I went from Narita Airport to Toronto. Usually it takes about 8 hours to get to Vancouver but.. It takes about 12 hours to get to Toronto. 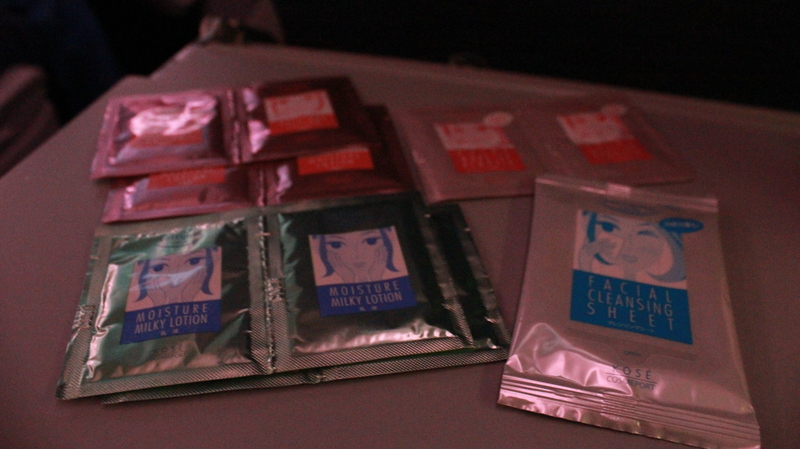 Whenever I travel by air, I worry about my skin. The air inside an airplane is very dry, so it’s hard on my skin and throat. 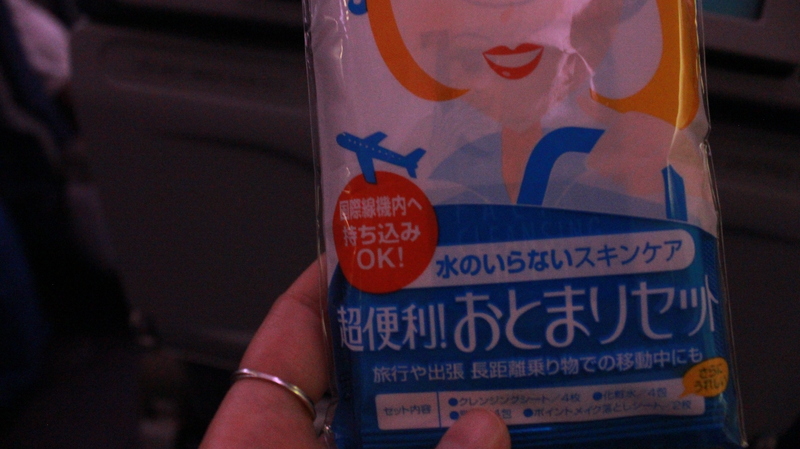 It’s a skin-care set for airplanes–no water or washing required. When you open the bag—there is enough for about 4 applications. It felt good to clean my face and put on moisturizing lotion before landing. I’d definitely recommend this to my female friends. Oh, by the way, when I said I was in Canada, I didn’t mean I had arrived at my destination yet. I’m going to Montreal, and THEN transferring to Prince Edward Island. It’s a long day, but it’s fresh and exciting for me. I’ll be updating in realtime on twitter and Facebook, so follow me there if you want! And if you want to follow other bloggers also reporting in Canada, please check the Canadian Tourism Commission‘s Tumblr page! Ok, talk to you again next time! Posted in Canada, Micaela, Tourism, TravelTagged アイランド, エドワード, カナダ観光局, プリンス, ミカエラ, Canada, Canadian Tourism Commission, ciaela, CTC, Explore, ExploreCanada, 英語, 観光, Micaela, Montreal, Prince Edward Island, Toronto, Tourism, travel, 旅行, 日本語Bookmark the permalink. Whenever I fly back from Japan to Germany it’s always quite a long – and never a direct flight. Yet I usually don’t do anything with my skin. All I do is brushing my teeth. If I have a long waiting time at an airport, then I might wash my face and put some cream on because I have very dry skin. Never had any skin issues when I left my make-up on overnight for flights etc. ciala have a nice trip to east canada i wish on your trip back if youhave time to visit ex: stay two day,s in montreal to try good cuisine ex :toqué restorant and kaizen sushi and bar on ste catherine’s street is a good choices”totemo oiishi desune” best to you. 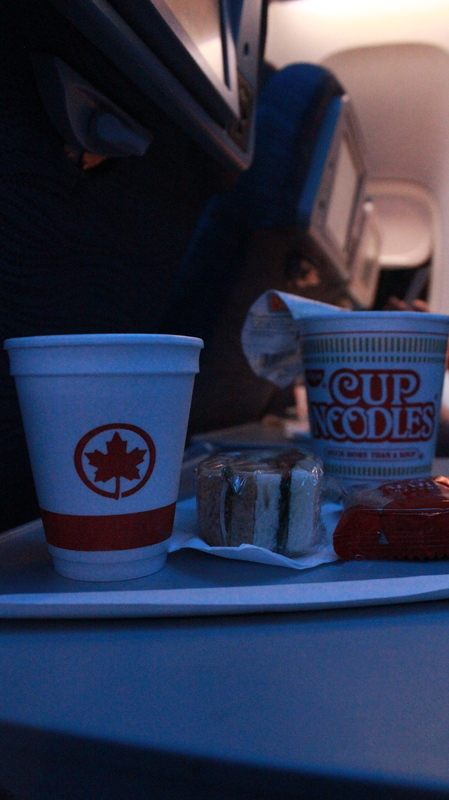 I have used Air Canada many times from Vancouver to Narita or Kansai but I never had “the soup”! Nice! I like it if they have it♪ 旅行用スキンケアセットって日本特有ですよね。私も必ず何かを機内に持ち込んで潤ってます！(^^) Have a great trip! 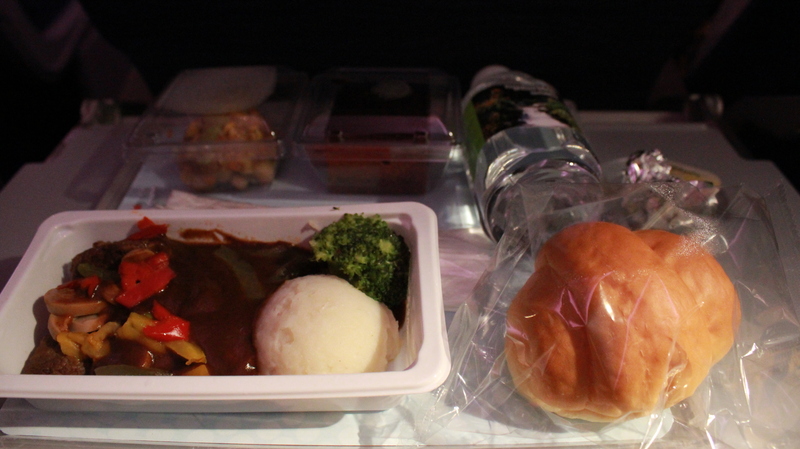 I have used Air Canada many times from Vancouver to Narita or Kansai, but I never had “THE soup”! I like that if they serve! 旅行用スキンケアセットって日本特有ですよね。私も必ず機内に持ち込んで潤ってます！(^^) Have a great trip! Are you coming to PEI!! I’m living in Summerside, PEI for 20 years and originally from Fukuoka. My Canadian friend in BC send me the link of your news paper article last month. for a while year!! We are leaving here in 10 days. Hopefully we can connect on the Island while you are visiting. AC1 to Toronto. Enjoy PEI. I’ll be in Montreal next month for a short trip. Nihonno onsenniwa walui wani ga sunde ilu baai ga alimasu . Waiting for your update info.